Four books by William Walker Atkinson, writing as Swami Panchadasi. Includes The Human Aura, Clairvoyance and Occult Powers, Reincarnation and the Law of Karma and Thought Vibration. William Atkinson (1862 - 1932) was an attorney, a merchant, a publisher and an author who wrote his books under several pseudonyms, including Swami Panchadasi. He was an occultist and a pioneer of the New Thought movement. Atkinson wrote over a hundred books but is now largely forgotten, due partly to his personal secrecy and to his use of pseudonyms. This edition is professionally designed and has been recently re-formatted for improved compatibility with devices and a fully-functional table of contents. 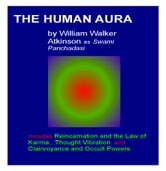 Published in 1912, The Human Aura explains the aura and how it affects the way we live. The book covers all aspects including health, healing, colors, emotional states, thought forms, magnetism, aura development and auric protection. Published in 1908, Reincarnation and the Law of Karma is a study of the Old-New World Doctrine of Rebirth and the Spiritual Cause and Effects. Chapters include; The Early Races; Beliefs of the Egyptians, Chaldeans, Druids, Romans, Greeks, Jews, Essenes, Hindus, and early Christians; The Modern West; Between and Beyond Incarnations; The Justice of Reincarnation; the Argument for Reincarnation; The Proofs of Reincarnation; Arguments Against Reincarnation; The Law of Karma. Published in 1916, Clairvoyance and Occult Powers contains twenty lessons in developing the latent powers of clairvoyance, telepathy, mind reading, etc. Thought Vibration concernes harnessing the energy of thought and directing it in constructive purposes. The following is a quote from the book; "I want to call your attention to the fact that nothing is too good for YOU – no matter how great the thing may be – no matter how undeserving you may seem to be. You are entitled to the best there is, for it is your direct inheritance. So don’t be afraid to ask – demand – and take. The good things of the world are not the portion of any favored sons. They belong to all, but they come only to those who are wise enough to recognize that the good things are theirs by right, and who are sufficiently courageous to reach out for them."